Hi! 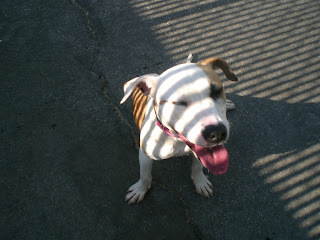 my name is Lucy, and I am a one year old Pit Bull. I've been here since June 9. I live in one of the cages at the intersection of building 2. Today Susan the dog lady FINALLY got a chance to take me out! 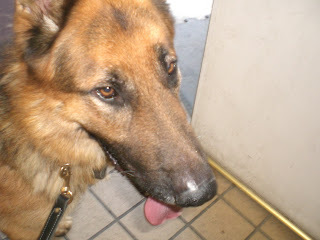 She walked me around a little and I got to enjoy her yummy chicken, salmon, liver, and beef treats. We played a little in the back play area. Susan tried furminating me and discovered a few fleas, so she whisked me into the bathtub and gave me a real quick bath. I wasn't very dirty and I didn't have many fleas, and since I am rather small and don't have a lot of hair (Pit Bulls aren't hair dogs! 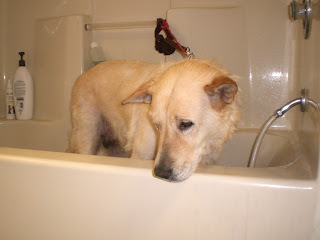 ), the bath didn't take long at all. I am a real friendly girl. Come on down to the shelter and say hello! 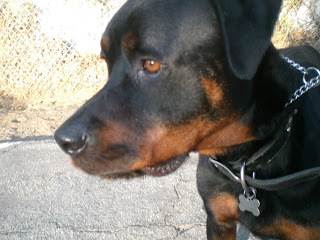 My name is Rocky, and I am a 4 year old Rottweiler mix. I live in C242 and I have been here at the shelter since March 2. Susan the dog lady is worried about me so she thought she better post my picture. I am a big dog and I am quite skinny. I ate Susan's treats tonight but she wasn't sure if I wanted a whole meal so she didn't try to feed me one. I stay pretty calm when all the other dogs are reacting to something. Susan thinks I am a calm sweet boy. Please come down and adopt me! 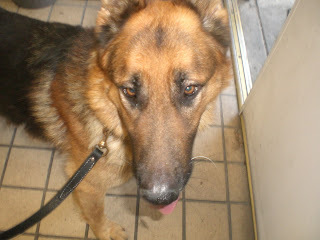 Hello, my name is Duke, and I am a five year old German Shepherd. I've been here at the pound since May 23. I live in building 3 in one of the corner cages at the intersection. I am a big dog with lots of energy to burn. I have so much energy that all the staff knows me because I puncture my metal food and water bowls with my teeth and then I toss them around like hockey pucks! 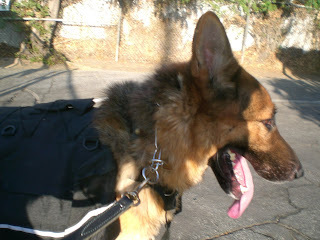 In this first photo, I am modeling a weighted backpack that Susan the dog lady has put on me. She's hoping I'll run with her while wearing it. In the second and third photos I am in the grooming/laundry room. Man I just don't have much patience when Susan furminates me - I just want to be outside moving! Susan did indeed run me around several times and I was panting! I slurped through 3 plastic bowls of water in the laundry room. I tried to take the bowl in my teeth but Susan took it away from me. But she was happy I at least got some water. 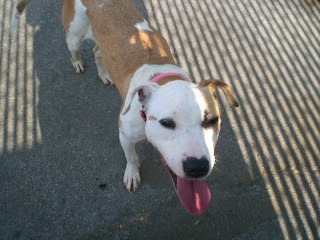 I need a home where I'll get lots of exercise and something to do. Even wearing a weighted backpack is something to do! Please come down to the shelter and say hello! Hi! This is the third time I've been here at the shelter since March. I was here in April too. I can't help it but I keep getting out! I know all the animal control officers here and wag when they show up to pick me up. 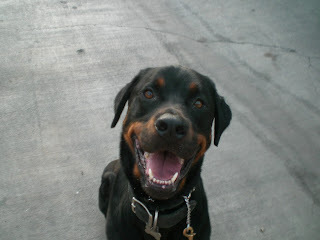 I know Susan the dog lady pretty well too, and I am so happy she will throw a ball for me! Susan uses a special type of training collar on me so that my long fur won't get tangled. It's a choke chain type working collar, but it has very large long links so the collar won't trap my fur and pull my hair out. I've been here since May 16, and Susan is mighty worried about me. I need a home on a nice big ranch where I can run around. I'm not a bad dog but I have a lot of energy to burn. 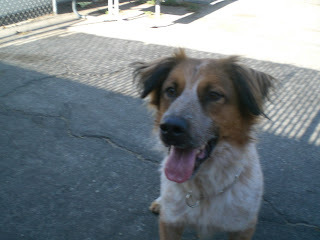 Won't you come down to the shelter and say hello and maybe throw a ball for me? 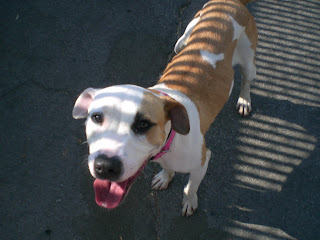 Thelma was euthanized last week. It's another tragedy that could have been prevented, had there not been so many dogs at Carson. But she had been here since February, and her time was running out. She was a great dog. Thelma was very handler-focused. If she walked to the end of the leash until it was tight, she'd come right back to you. Nothing made her happier than tethering her to my waist and taking her in the back while I did laundry. Thelma was very sociable and just loved being with people. Lots of kids had petted her. Thelma had shared her cage with other dogs. It might not be accurate to say Thelma loved other dogs. But instead of reacting to them, she'd ignore them. She was also good around cats. I was able to pet both her and Muneca, the shelter cat, without any problems. And whenever I walked her by the Cattery, she never reacted to the cats. Thelma was a good substitute mom. One day, another volunteer was bathing a puppy, which was howling in terror. I was helping the other volunteer while Thelma was tethered to my waist. Thelma sat down, and at one point nuzzled the pup as if to say, "Hey kid! It's not that bad!" Thelma's big sin was that she didn't "kennel well." In other words, she hated being locked up in her cage. She'd get emotional about it by jumping frantically. That turned people off, and they'd never consider her as a pet, even though once she was out of the cage she was as happy as could be. So the next time you're thinking about adopting a dog from the shelter, don't hesitate. Go do it. It's not just the vicious ones that get put down. It's not just the pit bulls that get put down (Boy, now there's a breed that gets a bad rap!) All dogs are at risk, and it seems to me it's particularly the bigger dogs that are at the most risk. So go adopt a dog and save a life. Hi, my name is Angel! 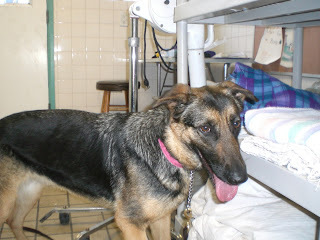 I am a 3 year old female shepherd mix. I just came in to Carson today. I live in C239. I was owner surrendered. The lady who owned me really wanted me and cried when her father insisted that she get rid of me. I was really dirty and covered with fleas. Susan the dog lady furminated me, then she used some quiet clippers to clip off some of my hair, since it was so flea-infested. 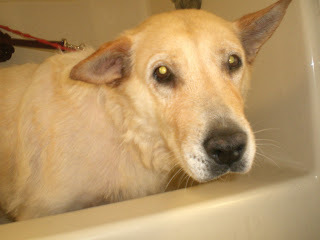 She gave me a bath at the request of George, the animal control officer who brought me in. I yelped in fear when Susan tried picking me up to put in the tub, so she got a whelping box to use as a step, got me up on it, and then she climbed into the tub and coaxed me up into the tub. Susan didn't think I was that dirty - until she started wetting me down and then watched the fleas start falling off. She was sorry that she didn't remember that there is a good flea dip available in the grooming room. She used a Biogroom flea shampoo, which worked quite well but probably took longer. I got one basic shampoo to make a dent in the dirt, then one flea shampoo. The fleas kept coming off in clumps! Then I got a cream rinse. Even during the third rinsing, there was visible dirt in the water going down the drain. These pictures are of me - AFTER the bath. Whew! I'm glad that bath is over! I didn't like it very much. Susan sang me "Angel of the Morning" and "Blueberry Hill" to calm me down. But I kept struggling to get out. I'm a little anxious being in such a strange place. George and Susan think I am a nice dog. Won't you come down to the shelter and say hello?